Current day residents got the rare opportunity to walk in the shoes of generations gone by during a special tour of downtown Bossier City this past weekend. A Bossier History Walking Tour was held during the East Bank Shop Small Market Saturday, Nov. 24, as part of the Bossier 175th Anniversary celebration. It was planned and hosted by the Historical Center of the Bossier Parish Library. 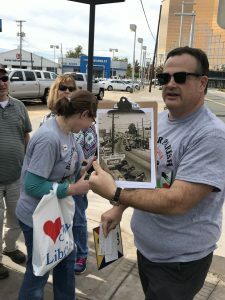 The tour was led by local historian and author, Kevin Jones, he gave the public a chance to envision what life was like decades ago in Old Bossier. Starting along Barksdale Boulevard and Mansfield Street in the current East Bank District, Jones told the attendees to rewind the clock 80 years to a time when there was no interstate and only two major roads in Bossier City, the current East Texas Street and Barksdale Boulevard. The latter, home to small retail shops and homes. Jones noted Bossier High School which sits in distance from the intersection, as well as pointing out the area was home to an old Studebaker dealership and one of two movie theaters, Davis Movie Theater. The next stop was the current Flying Heart Brewing and Pub, housed in the old Historic Firehouse No. 6. Prior to being a firehouse, it was a livery and stable and then a lumber yard. The station was home to the first professional fire department in 1952, with all fire forces previously being volunteer. 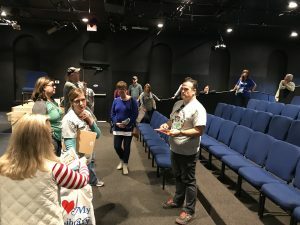 Then tour members were treated to an in-depth exploration of the current Bossier Arts Council, which had been the sole municipal building in Bossier City for many years. At one point, it housed the volunteer fire station, police, jail, courthouse and administrative offices. As police, jury and courthouse grew, they expanded in the 50s into an annex where the back parking lot now sits. 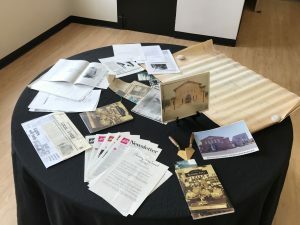 “Everything from the courthouse, to the library, city jails, police station and fire station were all housed in this building for several decades,” said Jones. The city offices moved to its current complex off Benton Road in the mid 1980s. In 1987, it was dedicated as the Bossier Arts Council and East Bank Theatre. The East Bank Theatre in the upstairs BAC once served simultaneously as the city court and library. In the back of the theatre, there still stands jail cells. Robin Jones, director of the BAC, told attendees that past judges will return to visit the building and share stories about the jail. “These judges who served will come back and tell us little tidbits about the history,” she said. In the parking lot directly to the east side of the BAC stood the Bossier Ice Company from the late 1920s to the late 1970s. Directly around it was housing, which was called home by nearly 1,200 residents. “People had ice delivered to their house, they didn’t have automated refrigerators. They had ice boxes,” Jones said. As tour attendees traveled closer to the Red River, they went further back in time. Jones noted that Elysian Grove Plantation owned by the Cane family, was eventually broken up by the family and sold off in parcels. The town developed around what is now the Louisiana Boardwalk Outlets and Bossier Elementary, which was the only school in town at one time. It was in the early 1900s that downtown Bossier began to develop, which comprised only the easternmost three blocks of the East Bank District. The first three blocks of the city were destroyed by fire that began at a home around 7:45 p.m. June 23, 1925 on the north side of the city. “There was no fire department. There was no water infrastructure. There was nothing to fight this fire. People were eventually throwing wet sacks on roofs to keep the embers from igniting them,” Jones said. The fire was extinguished by fire units from Shreveport. That tragedy served as the impetus to begin modernizing Bossier City, which became a town in 1927. Looking for more Bossier history, check out our blog with fascinating facts about the history of Bossier Parish. This says it was hosted by Kevin Jones, but I was under the impression it was planned and hosted by the Historical Center of the Bossier Parish Library? (According to the Facebook Event, at least. https://www.facebook.com/events/1423660281099008/) Surely they deserve a mention as well? That is a good point. We will definitely add that to the blog.